To match the long list of things to do is a long list of reasons I don’t want to start. I hate rethreading my sewing machine for new colors of thread. I’m never happy with the first version of anything. I want to keep all my beautiful cotton prints in the cupboard so that I can admire them and not have to cut them. OK, considering I have a large stockpile of FOE (fold over elastic) that I use for diapers, I’m a little embarrassed to admit that I had never considered using it for shirts like this, courtesy of one of my fave craft bloggers, Angry Chicken. 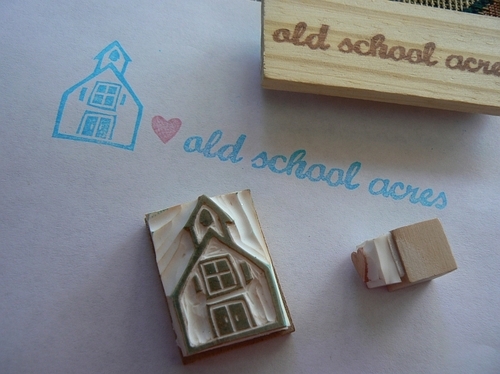 Old School Acres‘ new hand-carved stamps (purchased from Craft Pudding). A review of SouleMama’s book The Creative Family: How to Encourage Imagination and Nurture Family Connections and interview with Amanda Soule at WhipUp. I’ve got this book on my “accidentally put in the cart next time I’m shopping at Amazon” list. Here are a few of the craft blogs I have in my Bloglines. SouleMama. I find her work to be very inspirational, perfect for a little crafty pick-me-up. I tend to be not so cutesy as many craft bloggers out there, and find SouleMama’s stuff to be just cute enough, without making me want to vomit. How’s that for an endorsement? “Does not make me want to vomit.” Seriously, though. 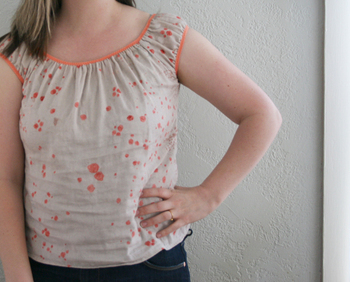 Amanda uses a lot of linen, vintage fabrics, and repurposed fabric. Love it. And she’s an unschooler, what more could you want? Old School Acres. A fellow Iowan, Laurie makes mostly stuffed items - adorable pigs, owls, etc. Though this not anything I will ever make or want in my own home, I love the look of her stuff, and enjoy her writing. She uses a lot of wool and tweedy stuff. Angry Chicken. Another sewer who makes linen goodies for her children. I love it. I love seeing crafters who use a lot of natural fibers. She seems like one of those moms who would be super fun to know, and super fun to have as a mom. Sew Retro. I’m supposed to be a member of this blog, but it’s beginning to get frustrating to ask repeatedly over and over to please send me an invite so I can actually post only to get no response. However, it is fun to have a theme to work towards, particularly since my vintage wardrobe was feeling a bit stale and consisted of entirely too many items that I simply cannot wear with a nursling. I enjoy seeing what others have created from past patterns, as well. FutureGirl. Futuregirl makes plushies and crocheted handbags. Again, nothing I would ever do, but I so enjoy seeing her items. She is creative in a fun way. I was going to say “unique,” but that’s really the essence of creativity, isn’t it? All Buttoned Up. Melissa, like so many of my favorite craft bloggers, sews mainly for her children and her home. Her stuff is so pretty in that coordinating prints way that I can never master. She’s also posted an awesome tutorial for making fabric boxes that I’ve bookmarked but not yet tried.